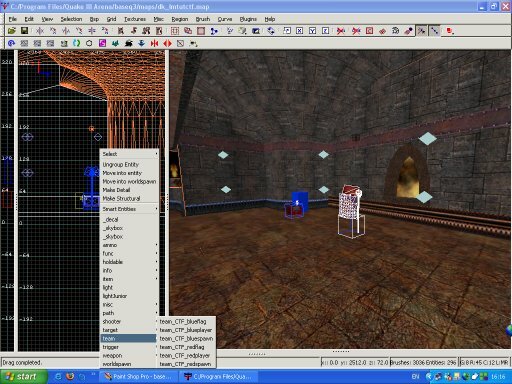 At several points throughout this series of tutorials it has been mentioned that the map is intended to be converted to a Capture The Flag Level. This section deals with that process. 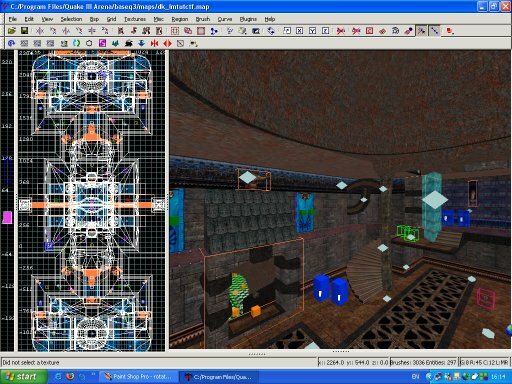 There are some utilities available that are supposed to automate the cloning and rotating of levels in order create the archetypal symmetrical CTF level. This article will discuss how to complete that process by hand. From the outset, the important of saving the map under different names at points throughout the process can not be stressed enough. GTK does not enjoy moving and rotating large sections of a map and might well give up and crash at various points. Fig.1 below, shows the mirrored level we are intending to create. Make certain you have nothing filter off. 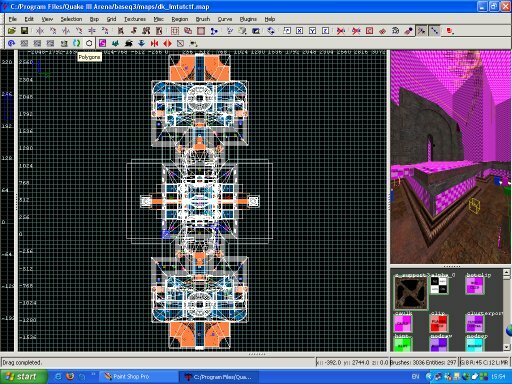 Before we make a mass selection, select and hide geometry on the existing base side that already exists in the area we are intending to place the cloned base. 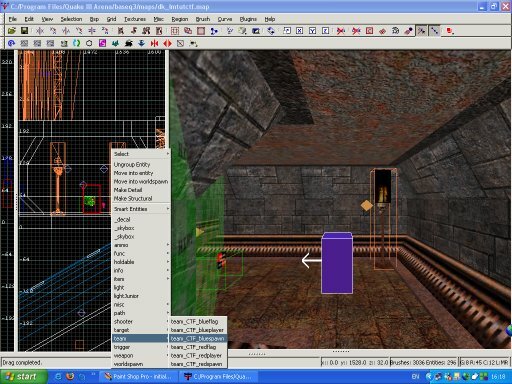 Delete the closed door ways that blocked of the un-built routes in the FFA version of the map.Draw out a large brush over the existing base (fig.2), then press the select inside button on the tool bar. Press i to invert the selection, then h to hide. Tidy up the parts of the base we want to select, hiding each brush that we do not want to select. 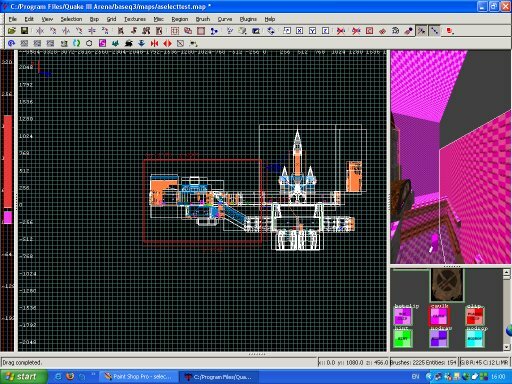 When only the parts of the base we require are left, press i to select all (fig.3) and un-hide the rest of the map. Now for the tricky bit, hit the space bar to clone the base. Switch to top down view, if you haven't already. Rotate the selection 180 degrees. Hopefully GTK will not have crashed at this point. Zoom in and move the selection carefully into place (fig.4). This is by no means an easy task, take your time and use a lot of care. I would tend to suggest moving the cloned base away from the rest of the map and saving the level as a temporary name. This way if you make a mistake, selecting the base a second time will be straight forward using the select inside tool. Having cloned and repositioned the base you will discover that the models, although having moved, have not rotated. 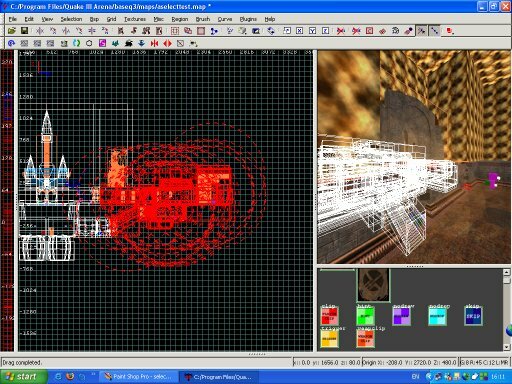 You will need to go through the new area and rotate each model, using the entity editing window (fig.5). This may seem like a daunting task, but it actually does not take as long as you might think. Now we have 2 neutral coloured bases. Not much good for red and blue teamed CTF games. 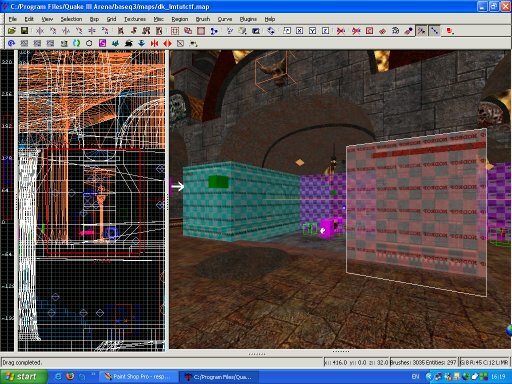 Blue and red versions of the textures used, or suitable replacements will need to be applied (fig.6). 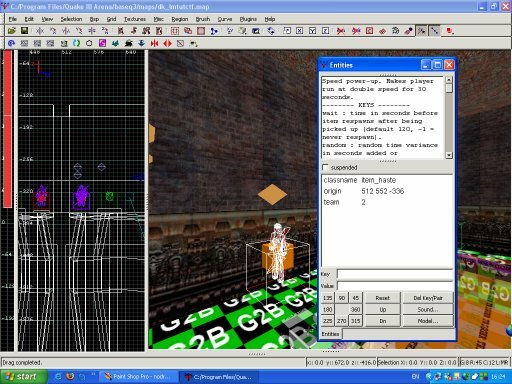 Again, selecting an area by the select inside button, then using texture find/replace is a fast way of doing this. The only long winded part of the process in the sample map was needing to make 2 new .ase models for the bases as it is not possible to retexture the neutral coloured models like normal brushes. To add to the overall effect, the colour of the base light entities should also be changed to reflect the teams colour. Target_location messages should also be altered. 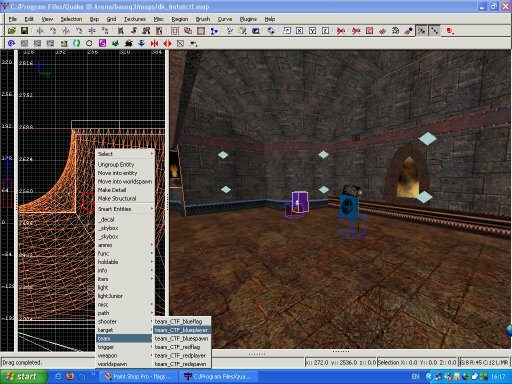 CTF games have specific game type entities. The most obvious new entity is the team_CTF_colourflag. This is the team flag entity (fig.7), and should be placed in such away that its attack and defence may lead to exciting and epic confrontations. 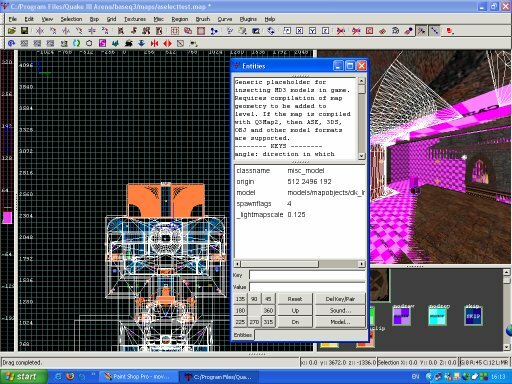 Instead of info_player_deathmatch entities, use team_CTF_colourspawn (fig.8) or team_CTF_colourplayer (fig.9). The first entity is the initial spawn point when a player enters the game, the second is the subsequent re-spawn point. Strategic placing of initial and subsequent spawn point is vital for good game play. The level may need some tweaking that for FFA play was not necessary. The large botclip brushes caused a small problem if the flag were dropped by a bot, by placing nodrop brushes over the top this problem was solved (fig.10). Finally, the item load will need to be adjusted from the FFA set to those more suitable for CTF. There is no longer any need for the teleporter as both cave areas must be the same. Try to balance item load so that both teams can have access to weapons and armour. 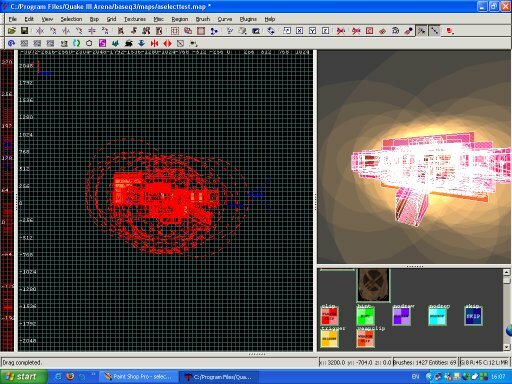 More powerful weapons or armour can be placed in the centre area in order to promote aggressive play. In place of the armour and mega health in the cave area some items have been teamed. Entities are given the key team and a team value, in fig.11 below the value 2 has been selected. These items will spawn in rotation, offering some variation to tactics and game play. A final word. CTF games are best suited to real players (although if you optimise your level for bots well enough they should give you a reasonable contest). If possible, beta test the level against humans in order to get a real feel for how well the level plays.